WEST PALM BEACH, Fla. – It’s been a bumpy road for taxi cabs in Palm Beach County. Metro Taxi says it took a 25% hit in business when Uber cars hit the road. “They have an extreme economic advantage over the rest of the industry,” said Brock Rosayn of Metro Taxi. Taxi cabs rates are regulated. Uber rates are not, so they are often half as much. Now taxi cabs are concerned about the economic road ahead. Under a new proposal Uber and other non-taxi companies will do their own background checks. The plan will split all car services into two categories. Traditional taxi cabs will be held to county regulations, and non-cabs like limos and Uber will be mainly self-regulated. Outgoing Palm Beach County Administrator Bob Weisman calls this a win for both industries. But, NewsChannel 5 Consumer Watchdog Jenn Strathman has learned Palm Beach County Consumer Affairs is concerned this proposal doesn’t protect the public enough. “Should the county be doing these more advanced background checks?” the Consumer Watchdog asked Weisman. “That’s a policy call and since Uber won’t cooperate and says that’s unacceptable to them we might put Uber out of business in the county,” Weisman said. The taxi industry says federal fingerprint background checks are done in other cities with Uber, but Weisman said he’s not sure what’s happening there and how the agreement is working. Uber plans to pull out of Broward County, where there are tougher rules, at the end of July. That’s something one Uber driver doesn’t want to see happen here. “Losing access to ride share services like Uber and Lyft is like losing your cellphone people don’t want to deal without it,” said Uber driver and rider William Leneve. The taxi industry is concerned the proposal under consideration is moving too fast. There’s a meeting this Friday for cabs and then it will be discussed next week at the county commission meeting. Weisman said some of the new proposals, which will be discussed at Friday’s tax meeting, could actually lessen the regulation on the cab industry. He expects most cab companies will soon be operating like Uber does now in the future, where most of their requests for service will come through an app. The county says it must move quickly because a temporary agreement allowing Uber to operate legally in Palm Beach County ends in September. Plus, the county is getting sued by some taxi cab companies over the Temporary Operating Agreement, and that trial is scheduled for mid September. For the latest consumer issues, or to report your own concern to Jenn, follow her on Twitter and Facebook . WEST PALM BEACH, Fla. – WEST PALM BEACH, Fla. – Palm Beach County commissioners are considering a plan that would take nearly 400 general parking spots in CityPlace and turn them into valet space for the new Hilton being built at the Palm Beach County Convention Center. Originally, the hotel’s developers planned to build a 630 car parking garage on-site. But now planners say they would like to save the space for potentially adding on more rooms in the future. 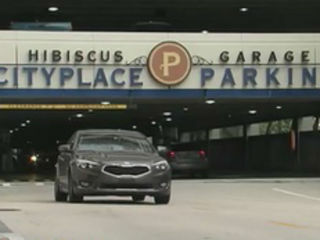 Developers are asking the county to allow them to instead provide 255 valet spots in a surface lot where the parking garage would have been and use 375 spots in CityPlace’s Hibiscus Garage for overflow valet parking as well. Business owners in CityPlace say they’re excited for the new customers the hotel will likely bring in. “It is a very, very convenient, strategic, fantastic idea of having a hotel right in the heart of CityPlace,” says salon and spa owner Anushka. But people who already shop and eat at CityPlace say finding parking there is hard enough without having to share spots with hotel guests. “It’s a pain,” says Emily Shotland. The shopper says if parking becomes harder to find, she’ll stop going to CityPlace. “They’re not going to have as much business if people can’t park there,” Shotland says. 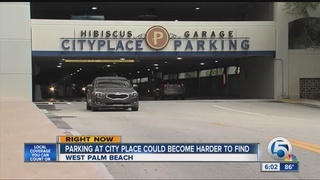 Palm Beach County’s assistant administrator and a spokesman from CityPlace’s Community Development District say the Hibiscus Garage is not being used at capacity and has room for more vehicles. A spokeswoman for Hilton says planners don’t foresee the need to use the garage every day. She says the hotel plans to only have an overflow of parking during special events. The hotel would call ahead and have spaces held for its valet service for certain days only. The spokeswoman says the spots would not be blocked off for the hotel every day.